If you've not yet picked up a 3DS — what are you doing? — then the 2DS is perhaps a tempting option. Released by Nintendo to target a young demographic, it also provides a slightly lower entry point than the standard and XL 3DS models; all you lose is the 3D effect and clamshell design. When it last provided figures Nintendo had sold over two million of these systems in the West, and deals keep popping up. 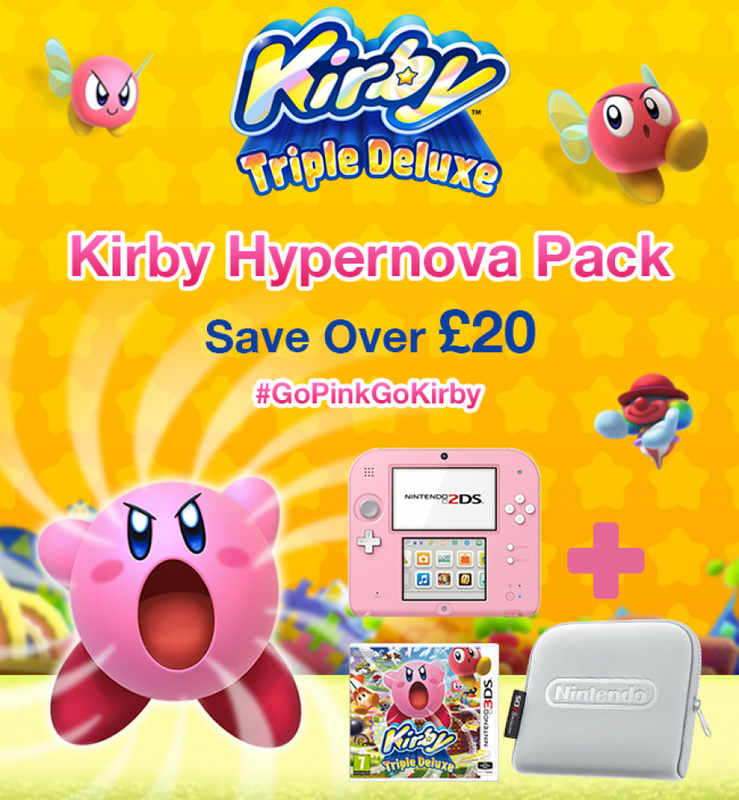 The latest from the official Nintendo Store in the UK is the Kirby Hypernova Pack (hit up that link to see the offer page) — it includes a pink 2DS, a copy of Kirby: Triple Deluxe and an official silver carrying case. It costs £129.99, and the store pegs the saving at £20. UK shoppers should also keep an eye on retailers such as GAME, with various models from £99 up, including pre-orders for the New Super Mario Bros. 2 bundle available at £109.99. Whatever your region there are often deals on the 2DS models. Are you one of the two million plus existing owners, or do you know anyone rocking the 2DS instead of the original models? I like that pink 2DS. Wish they'd bring out a 2DS XL. I don't like the way the button and stick colors are done on any of these colored 2DS models. It makes them look very childish and toyish with them either being the same color as the border or a totally different color to the face of the unit. The exaggerated contrast just looks cheap imo. Although to be fair, this is one of the less awkward looking offenders. Only the original black and white models work fully for me so far. @Kirk - "It makes them look very childish and toyish"
I think that's the point. No 3D for children's eyes. Nintnedo wants to sell them, but still wants adults to buy th emore expensive 3D models. The past 2 weeks I've seen 2DS on sale fo r$99 at Target - I thikit was even on the Shop - adn maybe BB fo r$109. So don't buy a $129 people, it's $99 somewhere if you want. Probably but when I was a child I didn't buy a SNES because it looked like a child's toy. I bought it because it was frikin awesome and just looked like a cool piece of gaming hardware. They don't need to make these things literally look like they were made by Fisher Price to sell them to children imo. It just means they are making machines that necessarily limit themselves to children only in terms of their physical appearance and imo that's kinda stupid when they could make machines that both children and adults can appreciate in terms of their physical aesthetic design; like the NES, Game Boy, SNES, GBA Advance SP, N64, DS Lite, normal 3DS/2DS models, Wii, Wii U, etc...which might be video game systems but they don't look like they were specifically made for 5-15 year olds or for only 25-55 year olds either for that matter. @ThomasBW84 "all you lose is the 3D effect and clamshell design"
@Kirk - "look like they were made by Fisher Price to sell them to children imo"
But they aren't trying to sell them to children, they are trying to sell them to soccer moms (and dads) who were worried about the 3D effect on a child's eyes, hence all the warning labels on the 3DS boxes. Thats why these don't have 3D. A mom in a store doesn't want to buy her daughter that cool looking - to us - jet black Vita, she wants to buy her daughter a pink 2DS. To me, the 3DS XL look like Fisher Price toys w those basic colors and rounded edges, so they've looked like toys for 2 years now, so Nintneod had to make these look EVEN MORE like toys to get parents to buy them for their kids. Fortunately for me my kids are old enough to know better and have had 3DS since launch when they were 7 and 9 years old, but I'ld guess that's who the 2DS are designed for - worried parents of 4, 5 ad 6 year olds. And trust me, parents do A LOT of worrying. I don't like how the 2DS looks imo. If it was one screen it would look better. Dualscreen looks better on clamshell IMO. Every time I use somebody's 2DS, it looks like it is bending backwards. I'm so used to the slight angle the 3DS has, facing each screen parallel to my line of sight. The main reason I like the 3DS is because of the 3D effect basically. So this was never for me. Well, in making the 2DS look more and more like an actual kids toy they're driving away everyone else that might have picked one up otherwise imo. It's a shame because the original Game Boy didn't look like a toy specifically aimed at 5-15 year olds. Neither did the DS (well certainly not once the DS Lite came out and that was the model that really drove sales of the DS through the roof) or the Wii and those are Nintendo's biggest selling consoles by far. You also get a slightly uncomfortable design where you have to stretch slightly to reach the shoulder buttons and especially if you are playing using the d-pad. Huh. I hadn't noticed that part! But the sound is just...so terrible. Anyway, I wanted this when it was first announced but I went and bought a 3DS XL finally instead! I do not regret that decision. This is all the kind of stuff Nintendo should have resolved before it released the 2DS imo. I agree with you there. It's a cute design, but not really that functional and there was definitely an opportunity to make it a bit better at app-like things than the 3DS. I love the fact that the buttons match the border on 2DS. Though I believe a darker hot pink would have been better than white in this one. @rjejr Sales which don't apply to the UK which is what this article is about. I bought my son a 2DS because he asked for it. I don't think they look like toys at all. My daughter and I both have the XLs. But I'm tempted to buy that sea-green 2DS one for myself. I think it looks cool and I don't really use the 3D on my XL. I got myself that very same 2DS, and I don't regret it (I have a 3DS XL, too). @Vyper68 I'm a pinkaholic. Just not this kind of pink. @Kirk - "more and more like a kids toy they're driving away everyone else"
I think I made that point in my original comment, or my original reply to you. Ninntedo would rather people pay $169 or $199 for a 3DS or XL than $129 or $99 for a 2DS, this is just for parents who don't know any better and are only worried about the 3D effect on children's eyes. Oh, and compared to the DS Lite and DSi the DS "phat" was ugly as all get out, even the red version. @Jazzer94 - No 2DS sales in the UK? (I think that's want you meant.) Are people buying it full price or does Nitneod really just not try/care in the UK anymore? The problem is that Nintendo shouldn't be dictating which model we're supposed to choose (within reason of course because obviously it's fine to aim a pink model at girls for example). That should be up to the consumer and as someone who has some issues with the 3DS XL I think it would be nice for the 2DS to be a viable alternative and not just the black or white models. I guess to be fair, the regular black and white 2DS models are actually fine (with the colored bands on them). So I guess there is actually a 2DS choice for the older more image conscious gamers. Still, why do all the full color options have to be for teeny-bops only. Has it not occurred to Nintendo that maybe some adults think the 2DS is a better option for them, even if only because of the cheaper price, and maybe they'd like some color options that don't look like they are solely for 5 year olds. Those were available in lots of colors but they didn't specifically look like girly-centric versions or models for 5 year olds. They just looked like awesome color options of a console design that basically suited anyone and everyone from a 5 year old girl to a 50 year old man could appreciate the design and color choices imo. I had the "watermelon" [basically pink] N64 and I actually thought it was one of the most gorgeous looking consoles I've ever owned. They looked more "designer" [very much like iMacs at the time] than "kiddie" imo and I think that's a better approach than what Nintendo is going for with a lot of these 2DS "Fisher Price" looking color variations to be honest. Now that's a gorgeous look pink handheld that doesn't look like it should only be owned by a 5 year old. It's mainly having the buttons be a totally different color from the main body (white buttons and a grey analog stick on a pink body in this case), which makes it look even more like cheap plastic, that's causing that subtle difference and making it look more "Fisther Price toy" and "kiddie" as I see it. If they just made the buttons and stick the same color, like on the pink DS Lite I think it would have worked so much better. I would apply that same thinking to any/all of the other colors models they have for the 2DS too. Kids could still totally lap that up and at the same time at least it could be appreciated by the grown ups too. That's surely more of a win win scenario for Nintendo. 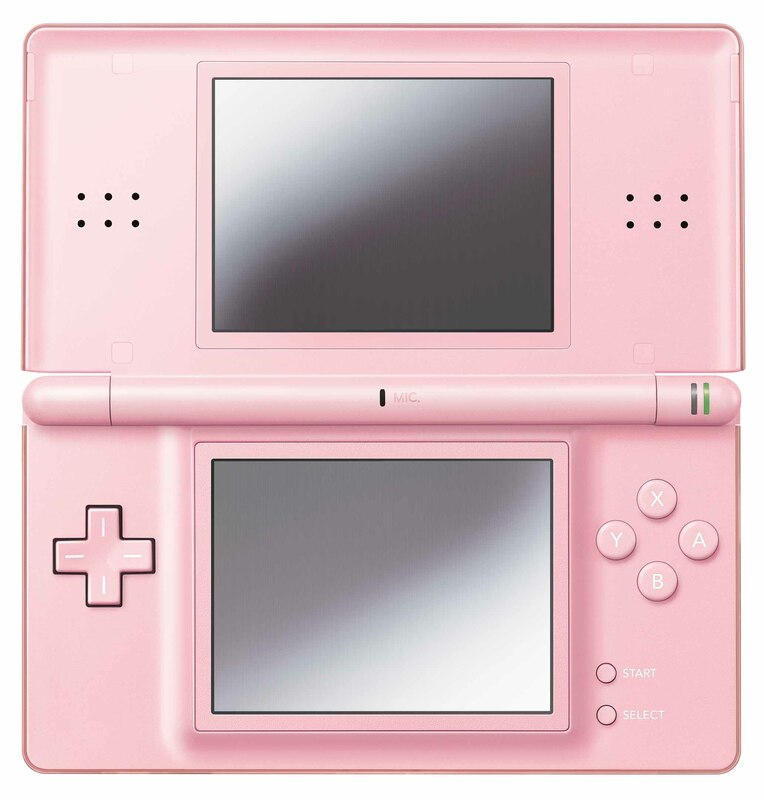 Note: Not that I actually want a pink 2DS either way...unless it's semi-transparent "watermelon"
@Kirk - "Thank God for the DS Lite"
My kids missed the DS Lite and started w/ the "i" so they are very excited for the Pokemon remasters as they haven't had a chance to play those yet. They've been asking for a red-green remake but Ruby-Sapphire will do. I love my 2DS, its form factor kinda reminds me of the old Game Boys, especially the Game Boy Advance. For me, it fits much better in my hand, and feels more comfortable to play due to the way the system is curved and the much larger L & R Buttons. I have an old 3DS that I replaced with my 2DS, and I don't have any desire to go back. The 2DS is everything I wanted in a handheld. As for the missing 3D feature, that does not matter to me since my eyes had trouble with the 3D anyway. As for the sound, I tend to use headphones when I play portables, so the lack of stereo does not bother me. Quite frankly, I don't get why people bash the 2DS so much. Its a good little system that is aimed at a specific portion of the market, namely children and adults who want to play 3DS games, but don't want to spend alot of money on a system. 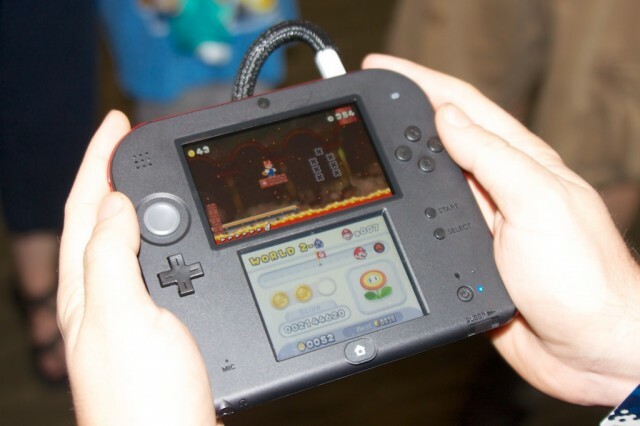 Given 2DS systems have gone as low as 99 bucks at times, I think Nintendo has a good idea with the 2DS. Namely. they have a handheld that can be sold cheaply, and is pretty easy to bundle with games to encourage sales. I think the 2DS has done nothing but help the 3DS family grow in terms of sales. I love my 2DS, and I can't see myself ever upgrading unless XL's get really cheap(at least 129 bucks). I'm not going spend a fortune on a handheld console, and the 2DS is the right price without losing very much in the way of features. 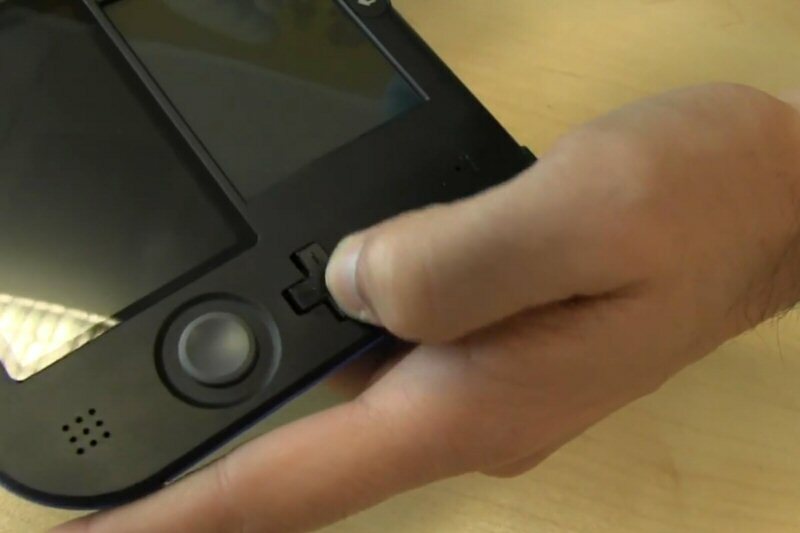 People who say the 2DS is uncomfortable have clearly never held it before and are solely judging it on appearance. The 2DS is the most ergonomic handheld console I've ever touched before. 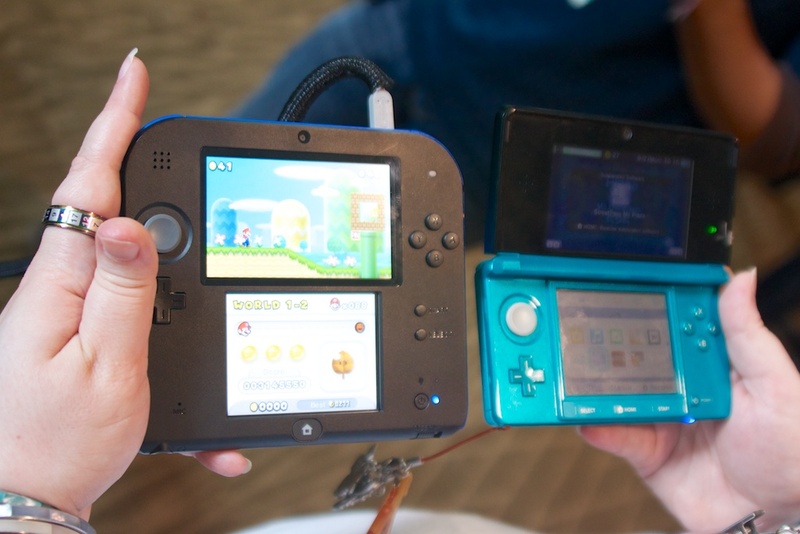 Say it looks funky all you want, the 2DS is more functional than the 3DS and 3DS XL - especially the original 3DS. my kids got the 2d's and my youngest has the peach pink 2ds...I have a 3ds xl and after playing around with both I can say that the 2ds is more comfortable to hold, and the analog is not slippery like my xl...for 100 bucks a pop you cant go wrong. If they made a 2ds xl I would be tempted to get one for myself. Or at least put all the GBA games on the 3DS/2DS Virtual Console sooner rather than later. So, you're saying it's not a stretch or slightly awkward at all to use the left shoulder button when your left thumb is using the d-pad (let's imagine you were playing Street Fighter 2 for example and wanted to do a fireball using the punch assigned to the left should button)? It's probably nowhere near as big an issue as I'm making it out to be and Nintendo has obviously tried to compensate for this by allowing you to click the shoulder buttons at the side rather than the top of the unit but it still seems a little bit strange imo. Maybe you get used to it after a while. @Kirk - "3DS/2DS Virtual Console sooner rather than later." It's Nintendo, I'm betting on "later". @Kirk - hairy wrist and fat fingers (I think that might have been a 70's funk band) aren't doing the 2DS any favors in those photos but it does show what I always suspected, the button and screen layout is really messed up on the 2DS. It should have the back triggers like the Gamepad. "It's Nintendo, I'm betting on "later""
Which is one of Nintendo's main/biggest problems these day imo; getting there too late. The 2DS is by no means terrible but with a few little tweaks it could have actually been genuinely great imo and missing those couple of extra tricks is something that has become a Nintendo trademark in the last few generations, also imo. I just wished Nintendo would realize their ideas fully rather than always stopping a little short as seems to be the norm for the company these days imo. @rjejr I was talking about pricing sales. @Kirk - "single large screen"
Yeah, Iv'e always thought it funny how Ntineod built the 2DS around a single screen then fuglied it all up. 1 big screen would have been nice for Youtube adn Netflix. And stereo, what's up w/ that, not enough room for another speaker? Kids under 6 going to go deaf due to stereo sound? 1 thing 2DS could have had that would have made it a huge success - tv out via mini HDMI or RCA (cable sold separately of course). I would have bought it day 1, ugly mono and all.